Food and treat dispensing dog toys should be in every dog owner's toolbox. They offer dogs fun, mental stimulation, and a great way to burn off energy. They help relieve boredom which can alleviate a lot of common dog behavior problems, such as destructive chewing, barking, and digging. There are a number of food and treat dispensing dog toys worth checking out—here are some of our favorites. Kong dog toys are hard rubber toys with a hollow center. You can stuff them with a variety of things, from kibble to your dog's favorite treats. They come in several sizes. The great thing about Kong dog toys is that you can make it easy or more difficult to get the treats out, so you can customize them for each dog. Small dogs, puppies, or moderate chewers may love a Kong dog toy filled with kibble and sealed with a little cream cheese. Larger dogs and dogs who love to chew may do well with a large treat surrounded by smaller treats and peanut butter. For even more difficulty, you can freeze the stuffed Kong toy. 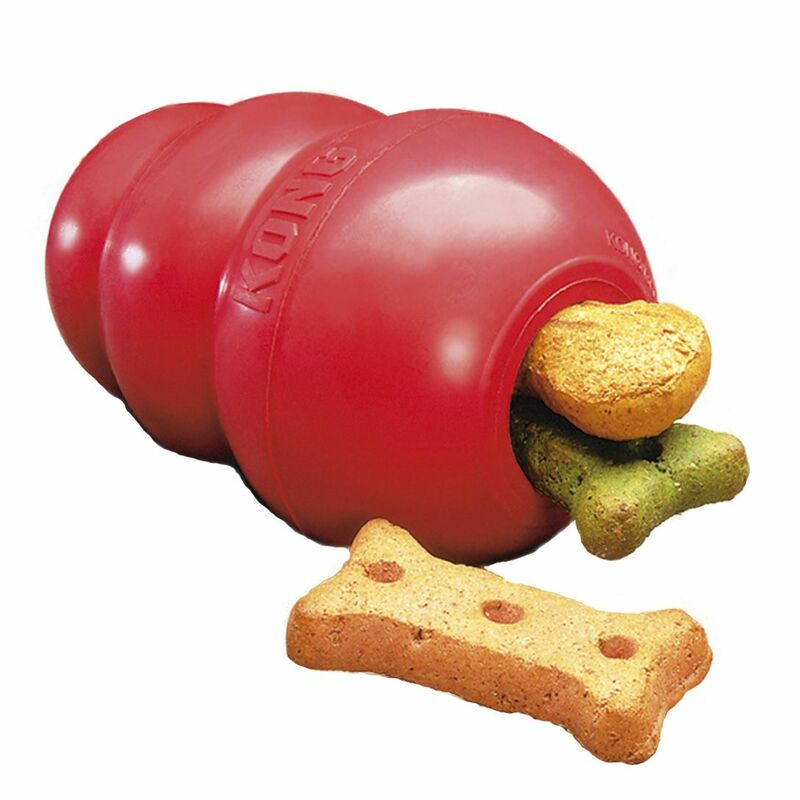 The Kibble Nibble dog toy is a plastic ball covered with rubber bumpers. Simply unscrew it to fill it with a dog's favorite treats or kibble. There's a hole on one side of the ball with adjustable prongs. Adjust the prongs to accommodate different size food or treats. As your dog rolls the ball around, treats will be randomly distributed from the toy. The Twist 'n Treat is a hard rubber dog toy that has two halves that screw together so you can accommodate a variety of food or treats in the middle. With the two halves screwed together, there's a notch on one side that allows food or treats to pop out as a dog plays with it. As long as food is kept small enough to fit through the notch, your dog should get regular rewards while he pushes this toy around. It's fairly easy for most dogs to work the food out of this dog toy, so puppies and moderate chewers seem to do best with it. The Buster Cube is a square dog toy made of hard plastic. Fill it with treats or kibble, and let your dog have at it. As your dog moves the cube around, the treats or kibble fall out. This is a little more difficult for some dogs than the round treat dispensing toys, but dogs who like to work, like Australian Shepherds, tend to love the Buster Cube. The tug-a-jug is a plastic, bottle shaped toy with a rubber ball and rope at the mouth. Fill the jug with kibble or treats, and your dog had to pull at the rope and move the jug around to get them out. It's fairly easy for dogs to get the food out of this toy once a dog gets the hang of it, and some dogs chew up the rope part, so it's probably not the best toy for strong chewers.